Abstract: The Southeast Anatolian Metamorphic Complex comprises three structural units, the Keban, Malatya and Pütürge-Bitlis Metamorphics. Of these, the Keban Metamorphics (Carboniferous-Triassic) mainly comprise metamorphosed limestones/marbles and phyllites, consisting mainly of calcite, dolomite, quartz, albite, phyllosilicates (kaolinite, 2M1 white K-mica, 1M biotite, IIb chlorite, C-S, C-V and I-S) and scarce tremolite/actinolite and biotite, which were metamorphosed under sub-greenschist- to greenschist-facies conditions. The Malatya Metamorphics (Carboniferous-Triassic) comprise mainly metacarbonate rocks and metapelites — made up of calcite, quartz, albite, phyllosilicates (anchizonal-epizonal 2M1 white K-mica and paragonite, IIb chlorite, dickite, C-V, C-S, I-S), chloritoid and goethite — that underwent a sub-greenschist-facies metamorphic event. The Pütürge Metamorphics (Precambrian-Permian) comprise metamorphic lithologies of pre-Devonian high-grade (augen gneiss, amphibolite, mica schist/gneiss, granitic gneiss) and post-Carboniferous low-grade rocks (calc-schist/marble and schist). The high-grade parts of this metamorphic unit display a Barrovian-type prograde metamorphism at amphibolite facies. Retrograde mineral occurrences, such as chlorite, C-V and C-S from garnet and biotite, reflect post-metamorphic-peak cooling assemblages. Low-grade parts of this unit are made up of calcite, dolomite, albite, phyllosilicates (IIb chlorite, 2M1 muscovite and 1M biotite, C-S), reflecting greenschist-facies metamorphic conditions. Lithological and mineralogical characteristics of the Southeast Anatolian Metamorphic Complex imply the following: the Keban Metamorphics are similar to the Eastern Taurus Autochthon (Geyikdağı Unit) and apparently originated from that unit. In spite of their similar age ranges, the Malatya Metamorphics are quite different from the Keban Metamorphics and were probably derived from northern allochthonous Tauride units (e.g. Aladağ Unit). The Pütürge Metamorphics originated from a southern source (i.e. the Arabian Platform), and horizons of similar age differ from those of the Keban and Malatya Metamorphics. 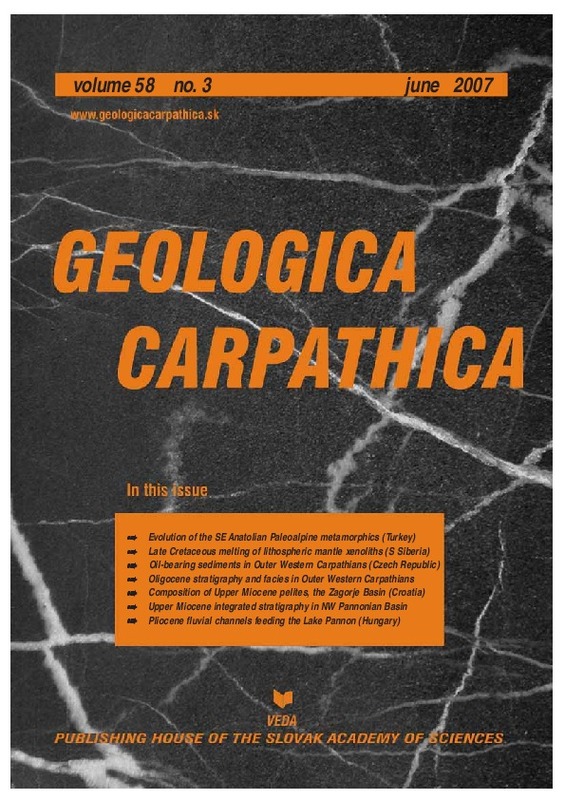 Abstract: The present study deals with the impact of hydrocarbons on changes in the physical properties of the sediments of the Zdanice-Hustopece strata in the flysch sedimentary cover in the south-eastern part of the Czech Republic. The discussed changes are mainly concerned with contents of natural radioactive elements Th, U and K. The subjects of the study are rocks from deep boreholes collected down to the depth of 3.3 km. The boreholes are situated in an area of local hydrocarbon occurrences and are divided into two groups — with and without hydrocarbon indications. Physical properties of sandstones and claystones from the two groups are compared. It has been concluded that the distribution of U and K in the Zdanice-Hustopece Formation indicates shifts in contents of these elements which are undoubtedly due to the presence of hydrocarbons. Abstract: Study of microfossils and calcareous nannofossils confirmed the diachronous onset of the Krosno lithofacies. In the Fore-Magura Unit the Reticulofenestra ornata bloom correlated with NP24 Zone (lower Upper Oligocene) was recognized within this facies while in the Zdanice-Subsilesian Unit in the underlying Menilite lithofacies. Onset of the Krosno lithofacies in the external Pouzdøany Unit is attributed to the Lower Miocene, NN3 Zone. The Zagórz Limestone intercalations were found as an important biostratigraphic horizon for the lower part of the Krosno lithofacies in the Zdanice-Subsilesian Unit and is attributed to NP25 Zone. Microplankton blooms (Limacina sp., bivalve juveniles, clavate planktonic foraminifers Beella and Bolliella, radiolarians, prasinophyte cysts, planktonic diatoms) and calcareous nannoplankton blooms (Cyclicargolithus spp., R. ornata) or abundances of some taxa (Pontosphaera spp., Reticulofenestra minuta, Syracosphaera sp.) are characteristic of the upper Menilite and lower Krosno lithofacies and reflect rearrangement of Carpathian orogenic zone, isolation of foreland basins and development of “Protoparatethys”. Abstract: According to X-ray powder diffraction analyses of Upper Miocene pelitic sediments from the Zagorje Basin all of the samples contain same mineral species, but in significantly different quantities. Calcite is a dominant component in most of the samples (31–74 wt. %), clay minerals (18–50 wt. %), quartz (5–21 wt. %) and feldspars (1–5 wt. %) are less abundant, while dolomite and pyrite are present only in a few samples. Among clay minerals, in <2 mm insoluble residue fraction, smectite, illite, chlorite and kaolinite were determined. The dominant constituents in 0.09–0.16 mm fraction, as determined by optical microscopy, are quartz, feldspars, rock fragments (chert, quartzite and schists) and micas. Chlorite, limonite, pyrite, garnet, tourmaline, zircon, epidote and staurolite are present as heavy minerals. Pelitic sediments within older (Upper Pannonian) investigated sediments are, in accordance with the mineral composition of insoluble residue and CaCO3 content, classified as marls, while those in the younger (Lower Pontian) sediments are silty marls. The observed gradual decrease in carbonate content, and simultaneous increase of clayey-silty component, going from older to younger deposits, is the result of the gradual increase of terrigenous influence. Mineral composition of marls together with elemental ratios critical of provenance (SiO2/Al2O3, K2O/Na2O, Eu/Eu*, La/Sc, Th/Sc, Th/Co, Th/Cr and La/Co) and source rock discrimination diagrams (Fe2O3-K2O-Al2O3 and La-Th-Sc), point out that source rocks were from the Upper Crust and remarkably felsic in nature. The chemical composition of the sediments and modal composition of silt-size fraction indicate Alpine provenance of the clastic material. Abstract: Magnetic polarity records from four wells and four surface outcrops from the non-marine Upper Miocene of the northwestern Pannonian Basin System have been correlated with the polarity time scale. Correlation between the wells (Duka-II, Nagylózs-1, Szombathely-II, and Zsira-1) was established by means of seven seismic horizons (A to G), calibrated biostratigraphically in the boreholes. Interpretation of the seismic horizons was extended to about 8000 km2 in northwestern Hungary. Correlation of the surface outcrops was based on biostratigraphy (Hennersdorf, Pezinok, Sopron) or it was attempted by seismic stratigraphy (Berbaltavar). Although the Hennersdorf, Sopron, and Pezinok outcrops all belong to C5n (11.04 to 9.78 Ma), the first is biostratigraphically older than the latter ones. This correlation implies that the MN10 rodents of the Pezinok outcrop are older than 9.7 Ma, the presently acknowledged MN9/MN10 boundary. The borehole sections in the western part of the Kisalföld (Danube) Basin (Nagylózs, Zsira, and Szombathely) were correlated with Chrons C5r to C3B (>11 Ma to >7 Ma), whereas the Duka section in the southeastern part corresponded to the interval C4Ar to C4r (>9 Ma to >8 Ma). The Berbaltavar mammal locality probably correlates with C4n (8.11 to 7.53 Ma). All these data combined with facies interpretation and seismic correlations suggest that the shelf break of Lake Pannon swept across the Kisalföld Basin from NW to S-SE in less than 1 million year (ca. 9.7 to 8.8 Ma). Abstract: During Pliocene to Pleistocene times, following the infill of Lake Pannon an alluvial plain was formed in the Pannonian Basin. The main bulk of terrestrial sediments are floodplain silts and clays; sandy to gravelly channel fill deposits comprise a smaller volume, but are excavated in several outcrops, as in Gödöllõ Hills. In the studied outcrops five facies units were described: medium-grained trough cross-bedded sand, medium-grained sand with compound cross-bedding, small channel fills with bedding parallel to basal concavity, fine-grained cross-laminated sand and massive silt to mud. Significant fining upward is rare, but decreasing thickness of cross-sets is often present in sands, defining cycles with heights of about 5 m. In the same outcrops, lateral accretion surfaces were also observed; together with cyclicity, they indicate point bar deposits of meandering rivers. Data from boreholes and a railroad cut has shown that channel fill sands are isolated within the floodplain sediments, but amalgamation of 3–4 channel fill sandbodies is common. The bankfull depth of the rivers depositing the studied sediments were estimated as 5–8 m. Direction of bend migration is indicated by lateral accretion surfaces, whilst a compound cross-bedded sandbody proved to be a confluence bar. Compared to the size of recent rivers, it can be concluded that one of the trunk rivers infilling the basin crossed the study area in the Pliocene. Paleocurrent data show that the river flowed to the southeast, towards the eastern subbasin of Lake Pannon.